Each year, the CDC reports more than 300,000 cases of Lyme disease and other tick-borne illnesses. Tick bites can lead to pain, itching and irritation in dogs as well as in humans; additionally, they can also lead to debilitating chronic and oft fatal diseases. Many homeowners are taking a firm stand by saying No to the use of chemical repellents to fight ticks. Instead, they are selecting organic and green tick control remedies and products to keep ticks away from their yards, homes and their dogs. Are organic tick control measures as effective as chemicals? 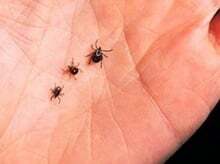 The uses of essential oils, as well as products like diatomaceous earth powder etc are quite common as far as organic tick control is concerned. Many pet owners have tried essential oils on their pets to repel fleas and ticks and experienced excellent results from them. Several of the once-a-month chemical spot treatments for fleas and tick control on dogs contain harmful carcinogens. Essentials oils, on the other hand, are all-natural and without harmful side effects.Some dogs do tend to sneeze or get irritated or run wildly in an attempt to wipe off the oils-however, apart from those, most pet owners have seen favorable results with organic tick control for dogs using essential oils. Dilute eucalyptus oil in coconut oil and add a few drops of the mixture on the pet’s collar. This will repel ticks. Rose Geranium essential oil is another wonderful organic tick control remedy. Dilute it and put a few drops on the dog’s spine. Thyme and oregano oils can also be diluted and rubbed all over the dog’s coat to repel ticks organically. Myrrh, grapefruit, Juniper and rosewood essential oils are some other remedies to control ticks organically on the pet . Note: Avoid pine based oils such as pennyroyal on cats as they are extremely toxic to them. Rub coconut or olive oil on the pet’s fur all over. Bathe the pet as usual with vet-approved tick/flea shampoo or organic products. This will repel and kill engorged ticks. As a last rinse, add some apple cider vinegar to the bath water. This will give a healthy shine to the dog’s coat while also repelling fleas and ticks. Add organic Apple cider vinegar to the pet’s drinking water to repel fleas and ticks and make it stronger from inside out. Many people also use essential oils when removing attached ticks on their dogs. A few drops of essentials oils of Cinnamon, peppermint, thyme or oregano can be applied on the attached tick. Using tweezers or forceps pull out the tick which will be incapacitated due to the oil. Once removed, discard the tick in alcohol solution. Apply a few drops of soothing calamine lotion or diluted lavender oil to the wound where the tick was attached. This will prevent infection. Dust diatomaceous powder all over the yard. Trim and mow the lawns to prevent hiding areas for wildlife that might be bringing ticks inside the yard. Wear protective clothes when you are gardening. Store firewood in sheds located far away from the main property. Apply beneficial nematode solutions to the yard, lawn, shrubbery etc. Inspect cats and dogs regularly for ticks. Inspect yourself and your loved ones after coming back from hikes. Comb fur and hair to remove ticks. Use prescribed methods to remove ticks carefully. Wash tick-inflicted wounds with organic soap solution. Hydrogen peroxide is also an effective and non-chemical based cleaner that can be used to wash wounds and prevent infections. Caulk cracks and crevices in walls, buildings and furniture to reduce hiding areas for ticks. Restrict dogs and cats to certain areas-do not allow them to sleep on your beds. Wash and dry the infested items and pet’s bedding using hot water and organic cleaners. Cleanliness is a must when ridding your home organically off ticks. Remove debris and dust the house frequently. Try and remove loose floorboards by nailing them. Keep vacuuming every two days and discard the vacuum bags immediately. It helps to use organic products like Diatomaceous earth powder and borax powders etc to reduce ticks and their eggs around the home. Simply sprinkle and dust all over-and behind and under the furniture and vacuum as usual. All this might seem to be a lot of work-but is not if it is done consistently and regularly. Organic tick control is very much possible and you will see fantastic results both by combining them with the chemical approaches or using them standalone.